The Congress today said that if voted to power, it would come out with a loan-waiver scheme for small and marginal farmers similar to that announced by the UPA government in 2009. Adopting a resolution on “Agriculture, Employment and Poverty Alleviation” at the party’s 84th plenary session, it hit out at the Modi government for its “flawed” and “anti-farmer” policies that have caused an “agrarian crisis” in the country. The resolution, moved by Punjab Chief Minister Amarinder Singh, expressed concern over the “failure” of the central government to deliver on its “lofty” promises and accused it of “duping” farmers “by making empty noises of doubling farm incomes by 2022”. The party claimed the scheme of the UPA government in 2009 had benefited 3.2 crore farmers. 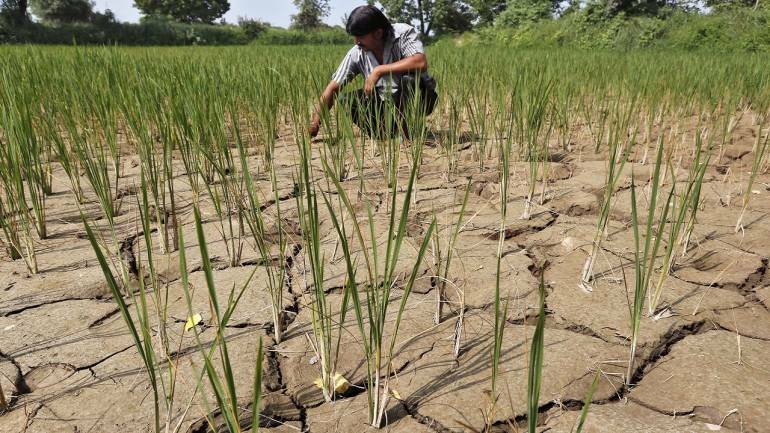 The crop insurance scheme of the Modi government benefited private insurance companies more than the farmer, it said, alleging that the money was taken away from farmers’ bank accounts without their consent. Alleging that there were rising levels of income inequality due to “anti-poor” policies of the government, the party said the BJP had promised ‘sabka saath, sabka vikas’, but it acted contrary to their slogan. The Congress said if the party formed the government after the general elections next year, it would set up a permanent commission for farm labour welfare with a constitutional status to guarantee social security at old age. The party said it would also provide interest-free loans to cover input costs to tenant farmers, sharecroppers and farmers owning and cultivating up to two hectares of land as was done by Congress governments in Haryana and Rajasthan in the past. It resolved to bring in a farmer-centric paradigm shift in the agriculture sector and restore profitability. The party said it will adopt a humanitarian and compassionate approach to enhance farmers’ income, ensure dignity to them, besides good education to their children, health care for their families and financial and social security through pensions. On the poverty alleviation front, the party said it will create a national poverty alleviation fund and impose a five per cent cess on incomes of the top one per cent people. “The Congress shall ensure that Aadhaar is not used to deny benefits to the poor,” the resolution said, adding that it should be used to improve targeting the eligible beneficiaries under the National Social Assistance Programme (NSAP) and other welfare schemes. “The Congress resolves to review the methodology used by the Commission for Agricultural Costs and Prices to determine the MSP (minimum support price) to guarantee remunerative income to the farmers, factoring all relevant input costs including warehousing and transportation,” it said. “The party shall expand the MSP regime to other crops and forest produce of tribal community and expand the procurement process to ensure that the farmer gets MSP benefits,” the resolution said. The party also said if voted to power, it would re-examine the issue of GST on agricultural equipment to lower input costs for farmers. Senior party leaders Randeep Surjewala and Ashok Chavan spoke on the resolution, which was drafted by a panel chaired by former Haryana chief minister Bhupinder Singh Hooda. The wealth of the top one per cent has gone up by 73 per cent while that of the bottom half of the population has grown by just one per cent during the BJP rule, it claimed.